I just received confirmation from WRNMMC for our January flower event, delivery Monday, 27 January. Saturday, 25 January 9 am till finished. An early valentine theme will be used so keep your eyes out for valentine accessories. I can't believe we're starting our 5th year delivering flowers to our heros. Thanks to all of you for giving your precious time and talents to the mission of Freedom Petals Inc. Thanks for all the continuous vases and flower items you donate thoughout the year. 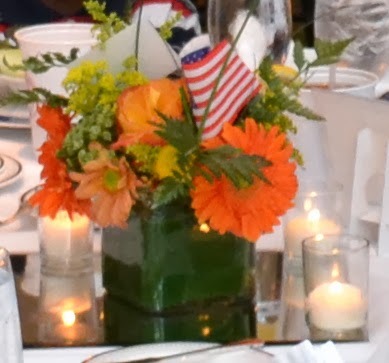 Flowers always brighten the Aleethia Dinner tables.